I have a friend who currently lives in Walthamstow (London, E17). But he won’t for much longer, so he invited me up to #Awesomestow (as it’s known on Twitter) for a final visit to some of the real ale pubs that he likes – with a couple of new ones thrown in for good measure. This is the first part of our tour. The second part will appear soon. We met at Liverpool Street station in London, and 20 minutes later we stepped off the train at Wood Street. Not the centre of Walthamstow admittedly, but in an area apparently known as Upper Walthamstow. 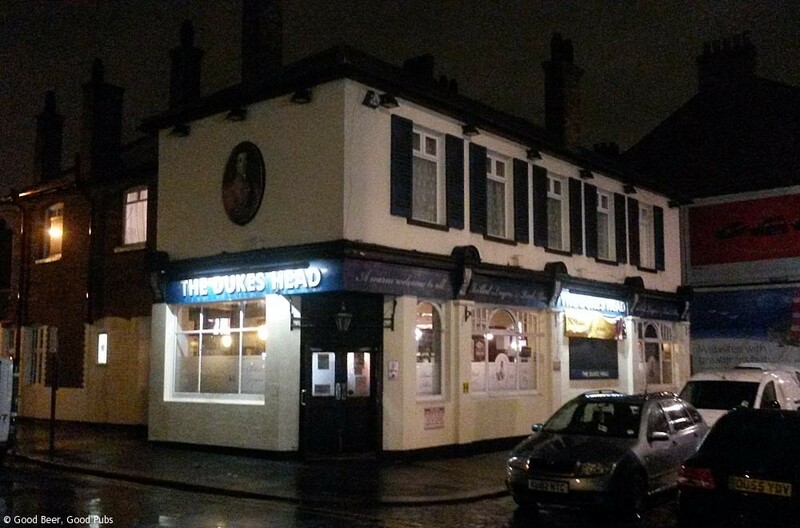 Our first pub was the Dukes Head (112 Wood St, London, E17 3HX) – about 3 mins walk down Wood Street from the station. The Dukes Head is a large single roomed pub with pillars to hold up the expansive ceiling. It’s a music venue with gigs every week or so. There’s a nice stage area at the front of the pub and very few seats in this area. There are more seats and a pool table at the back of the pub. Trumans Runner was available here and since I hadn’t had it for a while that was my choice. It was very tasty – more like a bitter than the paler beers I often drink now. The cold wind and rain outside coupled with the size of the venue meant it was a bit cool inside so we didn’t stay for more than one. Heading further north on Wood Street and then turning left onto Forest Road we came to the William Morris pub (807-811 Forest Road, London E17 4JD). Once again, quite large inside but more divided up into sections that the Dukes Head, and a lot smarter. I’m told this is because it’s just been refurbished. 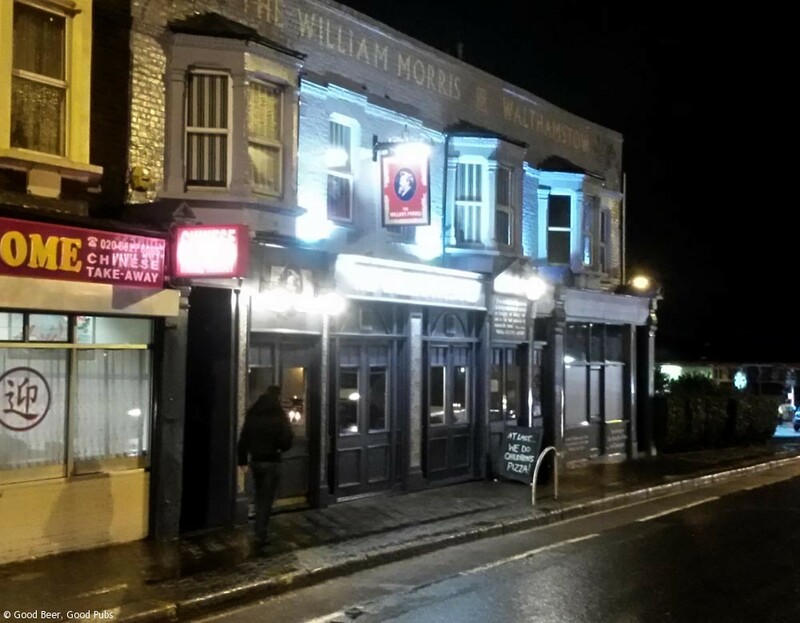 The William Morris, not surprisingly, trades on its namesake who was born in Walthamstow. The pub features examples of the artist’s wallpaper designs. 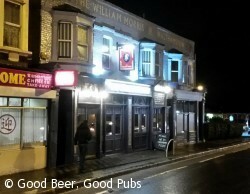 The William Morris has a few handpumps, but only 2 or 3 were working. We had halves of a beer called William Morris E17, allegedly brewed for the pub by Caledonian. One other beer on was Deuchars IPA – also by Caledonian. I didn’t see what the third one was. The E17 beer was nothing special so we moved on. Walthamstow has some grand buildings – especially on Forest Road. 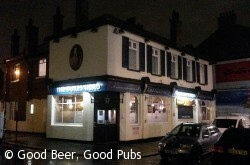 Some of them are situated just close to the William Morris pub. I’m talking about Waltham Forest College, the Assembly Hall and the Waltham Forest Council Headquarters. I do think the Magistrates Court needs to pull its socks up a bit. Anyway, hidden behind the Assembly Hall and next to the Council building is the Waltham Forest Social Club – an unremarkable single story building. You’re supposed to be members or show your CAMRA card to get in but no-one seemed to be checking when we arrived. The main area is quite big, with a stage over to the far right hand side. There is a smaller room to the left. The bar is straight opposite as you enter and there are a couple of hand pumps. One of the hand pumps was serving Milton Justinian – a lovely amber beer I’d had before at the Pembury Tavern in Hackney and the Harp in Covent Garden. I chose that one without hesitation, and wasn’t disappointed. This was probably close to being the pint of the night. Because of the superb beer we were tempted to stay longer than just one pint, and the social club were having an open-mic night that night too. But given it was possibly the last trip to Walthamstow for a while we decided to push on to the Bell just up the road. Part 2 of this pub crawl will appear soon and will include the Bell, the Olde Rose and Crown and the Nags Head.